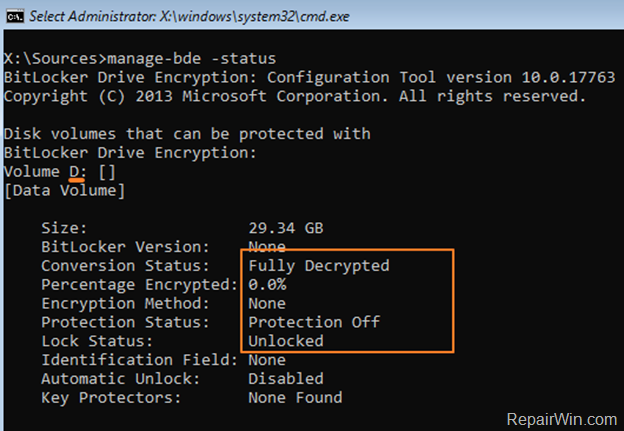 How to Remove BitLocker Protection & Decrypt BitLocker Encrypted Drive in Windows Recovery Environment (WinRE). A. 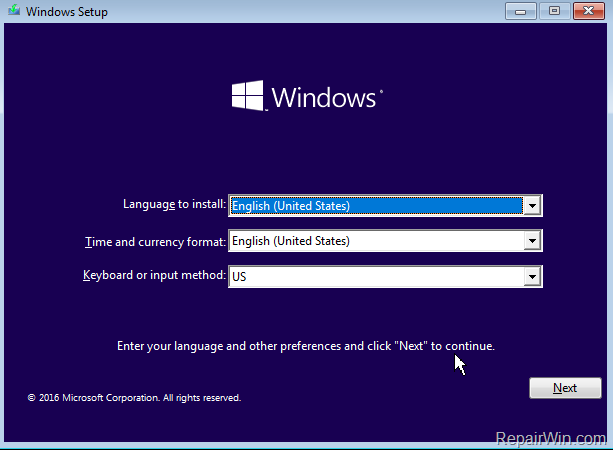 A Windows 10 Installation Media (USB or DVD). If you don’t own a Windows Installation Media then you can create one by using Microsoft’s Media Creation tool. * Note: If you don't have the BitLocker recovery key, there is no way to bypass the BitLocker protection. If a disk is BitLocker protected and you don't have the BitLocker Recovery Key or the password to unlock the drive, then the only option you have (in order to use the drive again), is to fully erase the drive by using the instructions in this article: How to Remove BitLocker Protection from a Drive Without the BitLocker Recovery key or Password. Once you find the BitLocker recovery key or the ΒitLocker password, then proceed to unlock the Bitlocker encrypted drive and to remove the Bitlocker encryption in WinRE, by following the instructions below. 1. Boot your system from the Windows 10 installation media. * Note: If Windows cannot start, then attach the drive to another computer and backup your personal data to another media. Then diagnose the drive for problems and if it is OK, put the disk back on the computer and perform a clean Windows 10 installation. « How to Update Chrome Components & Google Chrome Manually. » How to Remove BitLocker Protection from System Drive C: Without the BitLocker Recovery key or Password.